When one gets carried away with homebrewing to the point at which a stroll through the local supermarket's produce section frequently prompts the question, "can it be fermented?" one will inevitably consider the practicality of producing a fermented beverage using nothing but the bare minimum of ingredients--sugar, water, and yeast. Yes, sugar wine is possible and it's called "kilju" in Finland. Due to strict government restrictions, only a limited number of establishments are allowed to sell alcoholic beverages with an ABV above 4.7%. As we know from prohibition in the US, demand for alcohol tends to thumb its nose at regulation and consequently, Finnish punk subculture brews its own booze. This sounded like a fun project, if for no other reason than it being taboo somewhere in the world. Table sugar, water, and baker's yeast are all cheap, legal, widely available, and innocuous enough for anyone to try this at home but perfecting the process takes some careful consideration. I have no first-hand knowledge of the efficacy of baker's yeast for alcohol production and I probably never will. There are plenty of specialized strains of yeast available at my local home brew supply store. However, I turned to the internet this time and bought a bag of Alcotec Turbo Yeast. This stuff claims to yield 14% ABV in only two days and 20% in five. This is an ideal time frame--who wants to wait six months for something that's not even supposed to taste good? Turbo yeast reportedly imparts a flavor less pleasant than typical brewer's yeast strains, so I'm approaching this project with limited expectations. Another consideration I had was the use of inverted sugar syrup. Yeast already possesses the enzyme invertase, which breaks down table sugar (sucrose) into its constituent parts (glucose and fructose). I thought I'd save them the trouble and do it beforehand by boiling the sugar water for 20 minutes with a small amount of citric acid. This process, known as inverting sugar, prevents crystalization and is often used by bakers to increase the sweetness of desserts and give them a smoother consistency. Many internet kilju recipes imply early consumption, immediately following the completion of fermentation. I know all too well what that tastes like, so I plan to rack several times and possibly fine it so it's crystal clear, keeping the flavor and odor as neutral as possible. With the questionable reputability of the few kilju recipes available on the web, I decided to roughly follow the proportions on the bag of turbo yeast. I poured two gallons of spring water into a large pot, heated it to a rolling boil, and gradually added the appropriate amount of sugar. This only brought the specific gravity to 1.120, which would only translate into 16% ABV. What happened to 20%? I continued adding sugar until I reached the desired gravity. I added a 1/2 tsp of citric acid and stirred for 20 minutes to invert the sugar. Once the syrup had cooled, I poured most of it into a three-gallon carboy, leaving plenty of headspace. I stirred half the bag of turbo yeast into the remaining syrup and poured it into the carboy. I didn't bother to check the pH but this doesn't appear to be a concern shared by other producers of kilju, either. The turbo yeast instructions recommended not using an airlock. I was hesitant to simply leave the mouth exposed to houseflies and airborne bacteria so I covered it with one of those plastic sauce containers restaurants provide for take-out. The yeast got to work fairly quickly. I racked the kilju into two one-gallon jugs, leaving behind some particularly foul sediment. The racked kilju tastes, well... interesting. The kilju is still very cloudy. 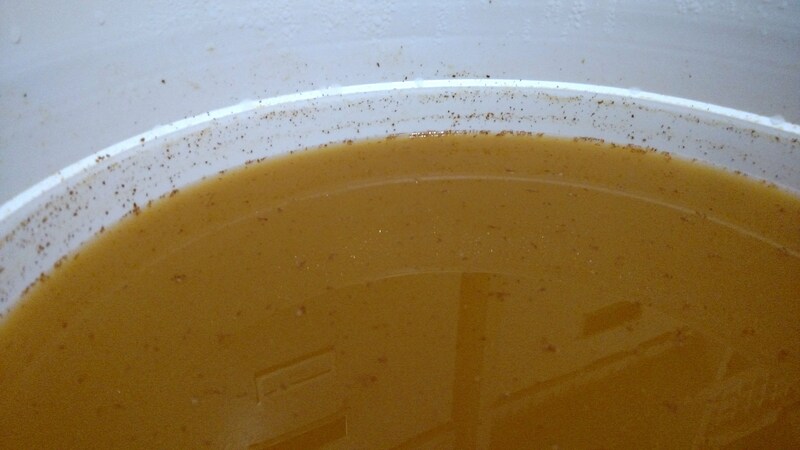 A small sample that was taken during racking was refrigerated and it mostly clarified, though it still retains a strong yeast odor and flavor. This odor is not repulsive, as many accounts on brewing forums indicate. It just smells and tastes like yeast, which I suppose might be offensive to those unfamiliar with it. I prepared a bentonite solution and let it sit for 24 hours. I racked the kilju into new jugs and stirred the bentonite in. The bentonite results weren't very substantial. I racked off the bentonite sediment into fresh jugs. I prepared a Sparkolloid solution and stirred it into the kilju. Sparkolloid seems to be more effective than bentonite on these particular proteins. The kilju is less cloudy, though still not 100% translucent, probably because of the residual sugar. Although Sparkolloid claims the wine will be ready in as little as a week, I read recommendations on several web forums to wait at least 30 days before bottling. After one week, it's true that the Sparkolloid has done its job and dropped the majority of suspended particulate matter to the bottom. However, being comprised of diatomaceous earth, extremelyl fine Sparkolloid particles may still be present in the clarified wine. This is not a problem for a commercial winery, as they typically sterile filter everything, but the home winemaker should allow more time to be sure all the fining agents have precipitated. My only experience with Sparkolloid thus far has been with a bottle of orange wine my friend made. It caused a strange feeling at the back of my throat that made me cough, so I wonder if that was a result of residual particles. The kilju looks very clear now, thanks to the Sparkolloid. I'll wait until a full month is up before bottling it, though. In an effort to clear up some space, I decided to filter the kilju and be finished with it. This stuff is essentially a novelty beverage, not an award winner by any means, and certainly not something I want to continue babysitting. I had purchased a Buon Vino Mini Jet filter a few months ago and attempted to use it but was a little intimidated by the process. The instructions didn't indicate whether it was safe to run sanitizer through the pump. Certainly, Star San would be a bad choice because it can corrode metal. I finally got in touch with customer support at Midwest Supplies, who recommended soaking the filter pads in a sulfite solution (940 ppm or 14 Campden tablets in a gallon of water) and running the solution through the machine to sanitize it. I resolved to give it another go tonight. It's a good idea to set up a large tray underneath everything because liquid will inevitably spill on the floor. Some clips would have come in handy because there are three tubes full of liquid (intake, output, and drain) that tend to twist about on their own and refuse to stay put. Siphoning from a partially-filled carboy is very difficult. Gravity works against the pump as it draws wine upward out of the source vessel, so the shorter the distance the wine has to travel before the tube bends and heads down toward the pump, the easier it is to get a siphon going. The filtered wine is on the left. The improvement in clarity was amazing. I thought the kilju was fairly clear after fining with Sparkolloid but compared to the filtered jug it looks cloudy. As you can see, I lost a bit of kilju during this step. This is inevitable, as the pump will not be able to pull the last half inch or so of liquid from the base of the carboy. I lost a bit more because I didn't have the two handwheels tightened enough and some of it escaped through the drain pan. Also, since a small amount of sulfite solution was going to come out of the pump first, I diverted that to another container but it was difficult to tell where the sulfite solution ended and the filtered kilju began because they looked so similar. I erred on the side of caution so I wouldn't end up with an extremely sulfuric, undrinkable kilju. The kilju looks brilliant now. The filter did seem to strip out some of the color, as the instruction manual warned. That's good--I was hoping this stuff would ultimately look like sugar water. As you can see I probably lost about one third of a gallon out of the initial two gallons. I'll be more careful next time. I let the kilju sit for a day to allow gas to escape. Then Jed and I bottled it into some empty 10 oz. soda water bottles I had sanitized previously. The filters didn't strip out the funky turbo yeast flavor but it's not terrible either. It's very sugary, like a Moscato, and almost raisin-like. I can only drink a small amount of it before losing interest, which is why I chose such small bottles. This will be an interesting beverage to bring out at parties when someone asks what kinds of things besides grapes can be fermented--how about nothing more than sugar and water?